The Audio-Technica AT-LP60XBT takes everything that made the AT-LP60BT Bluetooth turntable so popular and improved upon it. Whether you’re just getting into records, rediscovering an old vinyl collection or simply adding a turntable to complete your system, this fully automatic belt-drive turntable makes it easy to enjoy your records. This record player can also wirelessly stream music from your vinyl to any Bluetooth-enabled speaker. The AT-LP60XBT turntable has a stylish, molded body that is designed to resist resonance and feedback. Combined with vibration-absorbing feet, this record player’s design provides excellent audio quality. A hinged dust cover provides protection and can close while a record is playing. A lightweight, straight tonearm delivers outstanding tracking. The included Dual Magnet phono cartridge will make your favorite records sound better than ever. It features a replaceable elliptical stylus for great frequency response and an impressive output level. The AT-LP60XBT turntable’s stylus is gentle on wax, so your prized records will not suffer premature wear. If you ever wear out your needle, it’s simple to replace. 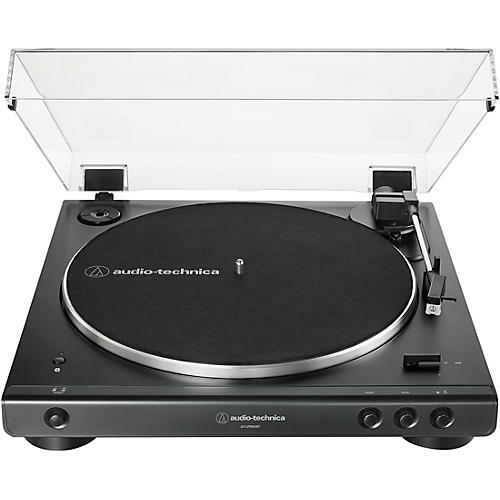 The Audio-Technica AT-LP60XBT belt-drive record player can play at two different speeds. Select from either 33-1/3 or 45 RPM with the simple touch of a button. These speed options will accommodate virtually any vinyl record manufactured since the 1950s, including smaller 7” records and 12” singles. User-friendly buttons power the deck on and off, and activate the tonearm. Another simple on/off button activates Bluetooth so you can enjoy the turntable wirelessly. The AT-LP60BXBT record player features a built-in switchable phono preamp, and can be connected directly to your home stereo, powered speakers, computer and other components, whether they have a dedicated phono input or not. Detachable RCA cables make this turntable easier to maintain in the long run. You can always leave the cables behind and enjoy wireless freedom by using the turntable’s built-in Bluetooth technology. To help reduce signal noise, this record player boasts an AC adapter that moves the AC/DC conversion outside of the chassis.